This type is also known as poor oil or small oil circuit breaker. In the bulk oil circuit breakers, the oil serves as both arcs extinguishing medium and main insulation. The minimum oil circuit breakers were developed to reduce the oil volume only to amount needed for extinguishing the arc - about 10% of bulk oil amount. The arc control for the minimum oil breakers is based on the same principle as the arc control devices of the bulk oil breakers. To improve breaker performance, oil is injected into the arc. In MOCB, The current interruption takes place inside "interrupter". The enclosure of the interrupter is made of insulating material, like porcelain. Hence, the clearance between the line and the enclosure can be reduced and lesser quantity of oil would be required for internal insulation. The interrupter containers of the minimum oil circuit breakers are insulated from the ground. This is usually referred to as live tank construction. For high voltage (above 132 KV), The interrupter are arranged in series. It essential to ensure that each interrupter carries its share of the duty. Care must be taken that all breaks occur simultaneously, and that the restriking voltage is divided equally across the breaks during the interrupting process. The thermal voltage division depends on stray capacitances between the contacas and the ground, and therefore is in very uneven. This is corrected by connecting capacitances or resistors in parallel with the interrupting heads. Figure 20 shows a three phase minimum oil circuit breaker along with cross-section through a single phase. One pole of a 3-pole outdoor MOCB is illustrated in Fig. 21 in some details. There are two chambers separated from each other but both are filled with oil. The upper chamber is the arc extinction chamber. The oil from this chamber does not mix with that in the lower chamber. Lower chamber acts like a dielectric support . Arc extinction device is fitted to the upper fixed contact. The lower fixed contact is ring shaped. The moving contact makes a sliding contact with the lower fixed contacts. A resin bounded fiber glass cylinder encloses the contact assembly. This cylinder is also filled with oil. Porcelain cylinder encloses the fiber glass cylinder. Other provisions are similar to the bulk oil circuit breaker. To illustrates the principle of working, the sectional view of working portion of 170 KV 3500 MVA, breaker of M/s Delle france is shown in Fig. 22. 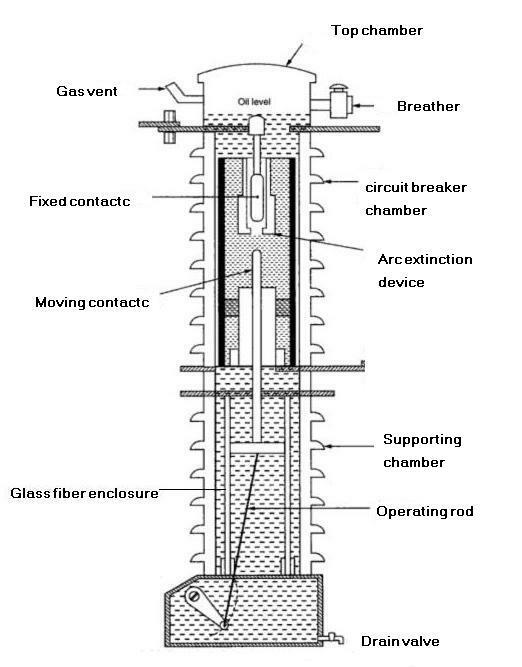 The most important part of the breaker is its extinguishing chamber. This takes the form of an insulating cylinder containing oil, in the exist of which moves the contact rod within which breaking occurs. Figure 22 Cross sectional view of working portion of 170 KV 3500 MVA breaker of M/S delle france. The arcing chamber is supported at its base by a casing enclosing a mechanism whose function is to move the contact rod according to the impulses given by the control mechanism. In the on position, the current flows from the upper current terminal ( 1 ) to the contact finger (2) follows the movable contact rod ( 7) and reaches the current terminal ( 10 ) across the lower contact fingers ( 8 ). At the beginning of the stroke and before breaking, the contact rod strongly pulled downwards by the tripping springs, starts a high speed opening motion. Then, an arc strikes between the contact rod tips ( 6 ) and the stationary arcing ring (3), protecting the upper contact fingers. 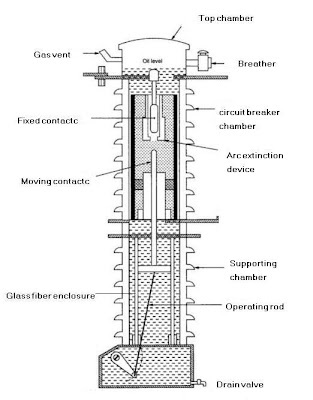 At this moment gases escape without hindrance towards top of the apparatus, the contact rod rapidly reaches a very high linear speed ; it moves the arc downwards and forces it to enter the explosion pot ( 5) where it is maintained rectilinear and is elongated in a direction opposite to the release of gases towards frsh oil. Since the arc is as short as possible the arc voltage is minimized and the energy dissipated is reduced. Still, since the gases can no longer develop freely, they generate a considerable pressure in the explosion pot ( 5 ), thus producing a violent upward axial blast of oil vapor, exhausting the highly ionized gaseous mass. The optimum distance is thus obtained, the jet of oil causes the dielectric strength to be rapidly increased, and at the following current zero, the arc is impeded from restricting and the breaking is thus achieved. The explosion pot ( 5 ) is intended to withstand high pressures. It is partitioned into several components by means of discs whose function is to retain a certain quantity if fresh oil while the first break is proceeding ; this allows a second break to occur with complete safety at the full short circuit breaker. The low oil content circuit breakers require separate current transformers of wound type. Still at all voltages from 33 KV and above the costs of these breakers inclusive of current transformers favorably with that of the bulk oil breakers.